It seems like all the beers I'm reviewing at the moment are collaborations. 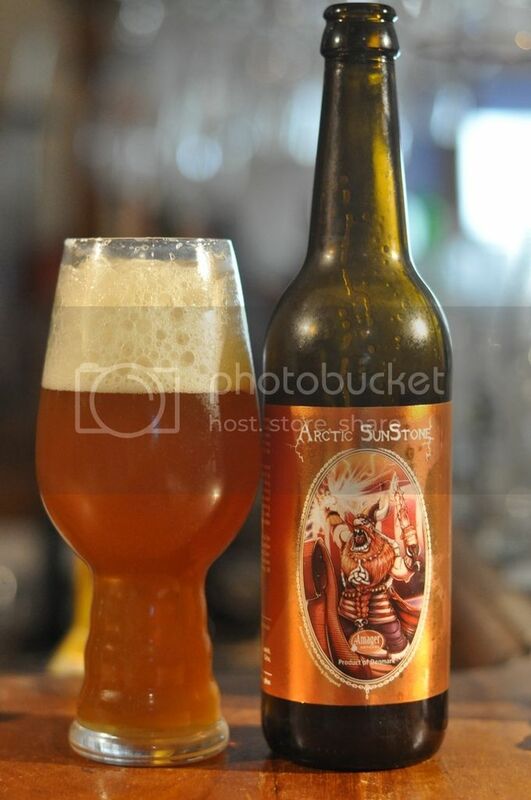 Arctic SunStone is brewed by Amager and Three Floyds from the United States. At 6% it's on the higher end of the ABV scale for an American Pale Ale. Considering the two brewers involved, I'm sure this will be good. I'm going to go out on a limb and say most of you can work out what the Danish Delight badge is for. If you guessed it's for drinking beers from Denmark, then you are correct. The Danes make some of the best craft beer in the world, led by the likes of Mikkeller, To Øl, Beer Here, Flying Couch and today's Danish brewer Amager. 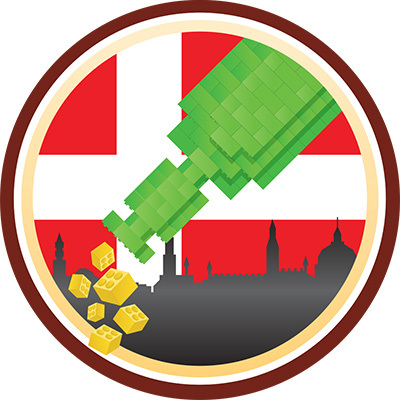 Enough about the Danish beer scene, it's time to sample their wares. As I poured the beer I noticed that it looked quite murky. That was still true when it settled in the glass, with this opaque orange colour lasting throughout. The head was big, fluffy and short lasting; although in fairness it did lace the glass nicely and there was a ring of foam left right at the end of drinking. Not my personal favourite looking beer, but there are plenty worse out there. Onto the nose and the malt base immediately seemed unusual to me; being quite bready and earthy. There was a touch a caramel sweetness as the beer warmed as well. The hops gave off aromas of massive amounts of tropical fruit, some citrus and even a few floral notes. The hops were exactly as I expected in this beer, with tropical fruits and citrus dominant. Mango, tangerine and grapefruit being the most prominent, while a floral element was also quite noticeable. The malts are well balanced and more bready than the nose indicate, the earthiness is almost non-existent. Arctic SunStone was a wonderful example of an American Pale Ale. It's wonderfully balanced and has this strangely light body that tastes full bodied. I can't quite explain the body, it feels wonderfully light on the tongue, but is quite malty for the style. I really suggest people who enjoy pale ale's try this one, it's not massively bitter, it's a lovely example of the style that I think most people would enjoy.